For more information, kindly visit our offices. APRICOT SEEDLINGS" > Apricots must be the most desirable of all the fruit trees to grow and often appear as number 1 one of the wish list. But they are also unquestionably the least hardy of all the fruit trees that may be grown in Kenya so planting Apricot trees requires some thought and planning. Apricots are very early flowering, infact they are the first of all the fruit trees to begin to open their blossoms, by far. The apricot favors well drained soil but doesn’t like to be too dry especially in the summer. Providing a happy medium between the two will be key to success and it is up to you to judge the type of soil you already have and influence the structure as much as you can. Too light or sandy then pep it up with lots and lots of organic rich material. Too weighty or sluggish then alleviate it with lots of grit, sharp sand and leaf mold. The soil should be well cultivated and friable; double dig-it over if it has not been cultivated before. Clear away all perennial weeds because the last thing you want is added competition from them when your trees are in settled, and growing. Prepare a hole large enough to take the roots. Apricots are vigorous growers and you may find the root system larger than that of other trees. Set the tree to the same depth as it was at the nursery previously – examination of the stem should reveal the soil mark still identifiable and this will tell you how deeply it was set in the ground before. In any event the grafting point should sit above the soil level and the roots buried in not less than 2” of soil. TISSUE CULTURE BANANA SEEDLINGS" > Bananas do well from a sea level of 1800M with a minimum rainfall of 1000m per year which is appropriate during flowering. Farmers in low rainfall areas should ensure that irrigation is done throughout. Soils should be fertile and well drained to avoid water logging. After these conditions are met, the farmer should get the plantlets from Oxfarm organic Ltd. Half a month before planting, pits measuring 3feet x 3feet x3feet should be prepared. Subsoil and topsoil should be separated, and then 40 kg of well rotten manure should be mixed with the topsoil along with 200g of fertilizer and 15g of the recommended nematicide. The banana hole should be filled with the mixture, and the plantlets should be planted 30 cm deep in the whole, and the soil should then be firmed. 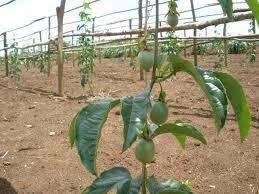 For crops under irrigation, 40 liters should be used initially then 20 liters, three times a week. Dry mulches should be used to retain moisture while heavy banana stems should be supported to avoid damage. Old diseased leaves should be removed while de-leafing is important to ensure healthy growth. Harvesting begins after 15-18 months, and a light shiny appearance means that the banana is ready for harvest. Harvesting should be delicate to avoid bruising of the bananas. The bananas should be temporarily stored in a cool, dry place and should be wrapped in banana leaves or grass to avoid bruising. If for export, they should be washed using a disinfectant and might require branding.